Did I do okay? – Nice dress! Thanks, I made it!! I never thought about tracing my pattern pieces until just now and I am “sold” on pattern tracing. Recently my sister, Bon-Bons & Bootcamp, gave me her new pattern, some material, etc. to sew some active wear for her. I couldn’t bring myself to cut the pattern out because it wasn’t actually mine. So I decided to trace it. An easy process… although I didn’t have any instructions, tips, or hints, on “how to”! So I put my tissue pattern pieces on top of some purple tracing paper on top of some large poster paper and traced over my size and all the other markings with my tracing wheel. I found the poster paper on a large roll at the craft store. Just perfect for this job! I also wrote every important detail on each piece, then cut them out. BONUS!!! Now besides being able to use my patterns for my up and down weight, I can also use them for others. I can also have sturdier pattern pieces made of heavier paper to cut out my material. 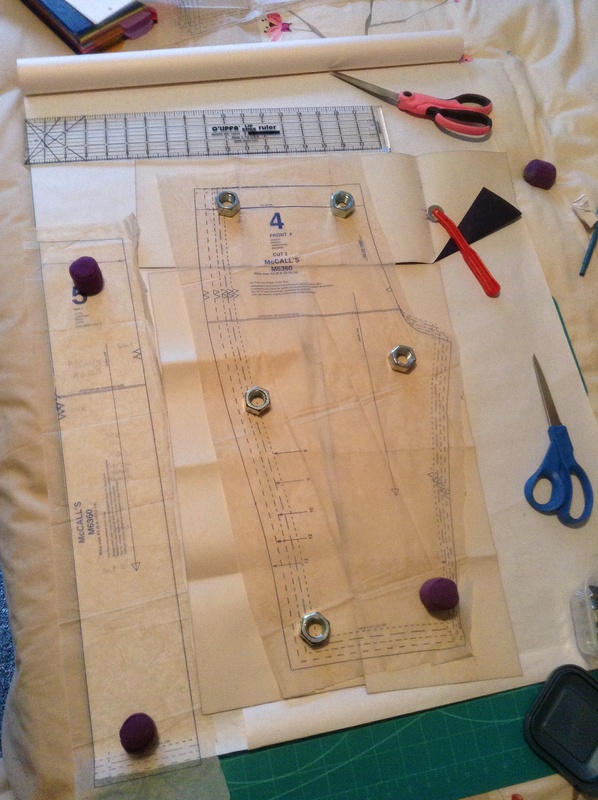 Then there is also the ability to make easy alterations with the newly traced pattern pieces! Those tissue pattern pieces always ended up rumpled and torn! How did I do? Did I miss anything In the process? 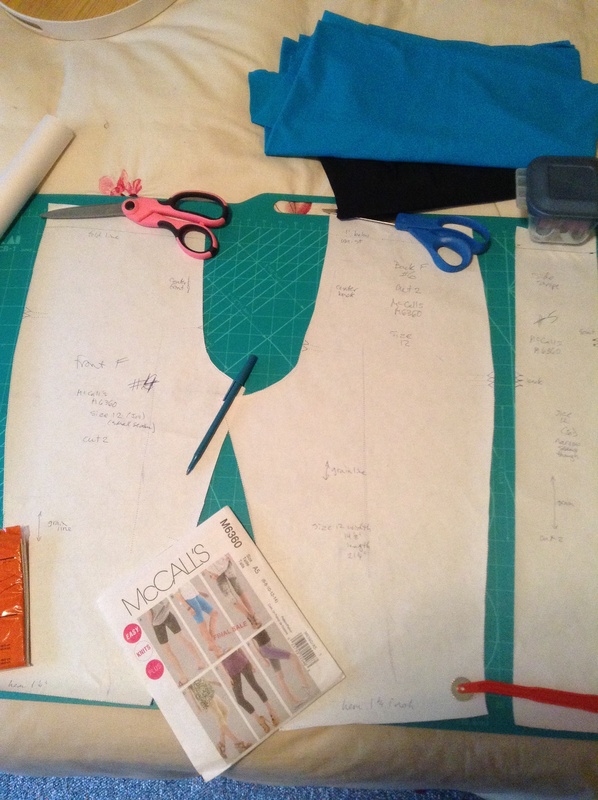 Do you prefer to trace your pattern pieces? Why do you trace your patterns? You used a light-weight poster paper? The other thing is you could also write notes on the pattern piece itself. Good idea! Thank you, but other sewists are already tracing their patterns. I am just finally catching on! How funny that you just wrote this post – I was literally having this conversation with myself yesterday! And what did you have to say to yourself! :). Any suggestions? I always trace. It’s what I was taught to do when I first started sewing and since I mostly sewed from magazines back then it was a necessity because these magazines fit as many pattern pieces on a single sheet as they possibly can so they’re all overlapping. I think you did perfect. I now prefer to use Swedish tracing paper for tracing because it is really sturdy, easy to see through and doesn’t wrinkle as much as regular tracing paper. It is a lot more expensive though. I will have to check that out, Swedish tracing paper. When I started all patterns, McCalls, etc. had only one size in a pattern package. You bought your size and the pattern was all your’s. I complained when they started putting more than one size in a package. Now I think it is a great help because my measurements are all over the chart! Yes, when your measurements don’t fit in one size a one size pattern just won’t do. I always need at least one size larger for my hips. Me too! Ok I’ve been reading up. I’m going to get some Swedish tracing paper (thanks for the tip!). I see 10 yards for $10.00 on amazon. I will keep looking though to make sure I am getting the best deal. Can’t wait to try it on my next pattern! Thanks! I will take a look at that site. Thanks! I trace sometimes…Vogues and Burda’s usually get traced because they cost more. I just use wax paper and a Sharpie for my tracing. So far, it’s worked for me! I like wax paper because it’s readily available and cheap. Thanks for the idea! I found out shipping for the Swedish tracing paper cost as much as the tracing paper itself! I’m not willing to spend that much! Oh I always trace patterns. Just in case I gain weight or I want to make same pattern for someone of different size. Also make it easier if I make mistakes in altering the original pattern to suit my needs. Plus if I decide to part with the pattern it is still all in one pice and could even sell it. But that’s not gonna happen. I am very protective and attached to my patterns. I use either you method to trace on parcel paper or baking or freezer paper roll. However some times you need bigger pieces. But this is easily sorted with some sticky tape. Yes, I am going to go with the tracing from now on. Just checking out what kind of paper to use now. Thanks for the help! I use tracing paper from an art store. They have rolls of really cheap tracing paper that’s light enough to place over pattern pieces and see clearly enough to trace, but heavy enough that it can be pinned (and repinned, and repinned…haha!). Make sure to get a wide roll, so that skirt pattern pieces will fit entirely on the sheet, instead of needing to have corners overlapped and taped on. One last suggestion: before you trace the pattern, double-check that the pattern’s tissue paper doesn’t have any tiny wrinkles. Those wrinkles WILL affect the fit, especially if they influence strongly curved edges, like around arms or collars, and can change the direction of the grainline. If the wrinkles are there, a medium-heat iron with no steam will press them out without any troubles. Thanks for the help! I am hoping to get to the craft or office supply stores this weekend and give pattern tracing another try! Hello again. I too am a recent convert to pattern tracing. I started to do it when I started to use more and more vintage patterns that were very fragile. I use some stuff I found on the internet. It sort of resembles fusible interfacing, but without the fusing glue. It is lovely and sturdy and flexible so can be pinned on a dressmakers mannequin for preliminary fitting purposes. I have no idea where I got it from or what its technical name is sorry! The labels from the rolls are long lost. I’ve heard about something like that. I found it online but the shipping was way too expensive. I use a heavy, see through tracing paper and it is working out great, although I can’t pin it to my “Dolly”! 😞 I have been tracing ever since I wrote this blog. I really like tracing better than using the original pattern. It’s so much sturdier and I don’t worry about the tracing if the cats get into it! I’ve started tracing too the year after finding out it’s the ‘done thing’. I find it really therapeutic and end up tracing off more patterns than I end up sewing. I use greaseproof paper from the supermarket, it’s less than £2 for 10 metres, and is usually wide enough for everything except sleeves. Now I need to find a way to store all my rolled up patterns! I started because the tissue pieces seemed to get destroyed too fast between me using them and the cats (two, not a hundred) running around. I do like having my patterns “like brand new” after I have used them! Thanks for the tip on where to get paper! When it comes to the rolled up tracings, I have heard some bloggers hang them in the closet like a pair of pants, some lie them flat on a large board under their bed or under their cutting table, and some roll them up and store them in re-used long wrapping paper tubes – if you have seen those? I must admit, I don’t treat my tracings well – they are tough though – I just fold then back up and put them in a large plastic zip bags in order in a box (well numbered so I can find them again).